After visiting Kapuzinerberg, you can look over the menu at this restaurant. If you appreciate German and Austrian cuisines, complete your collection with S'Kloane Brauhaus. Try mouthwatering dumplings, escalopes and wiener schnitzels that are served at this place. Many people come to taste nicely cooked gelato, pancakes and vanilla ice cream. Come here and order delicious wheat beer, lager or cordial. Take your chance to taste good cortado. It's easy to find this spot due to its convenient location. On the top of all that, the staff is attentive. If you want to enjoy fabulous service, you should visit this restaurant. According to the reviewers' opinions, prices are adequate. At S'Kloane Brauhaus, guests can enjoy the quiet atmosphere and fancy decor. TripAdvisor users rated this place 4.5 out of 5. Love this place!!! 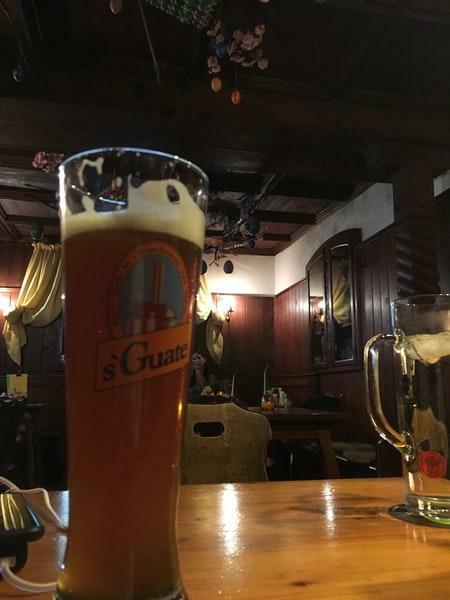 Best beer in Salzburg!!! The only problem is the working hours. Thay open late in the afternoon and they are closed on weekends. But if you search for an evening dinner with perfect Salzburg cousin accompany of best beer there is search no more. Rear gem!! !